Nina Alvarez is a journalist, documentarian and video photographer. For over twenty-five years, she has reported breaking news and feature stories from around the world, on broadcast and web segments, radio reports and long-form documentaries. Alvarez began her journalism career at ABC News, where she was a production associate on the acclaimed documentary series, Turning Point. She went on to work in the Miami Bureau covering news in the southeast US and Latin America and established the Mexico City Bureau in 1997, reporting and producing breaking news, feature and investigative stories in Latin America and the Caribbean. Her work with the network's top on-air talent was broadcast on World News Tonight with Peter Jennings, Good Morning America, Nightline and 20/20 and was recognized with three national Emmy Awards. 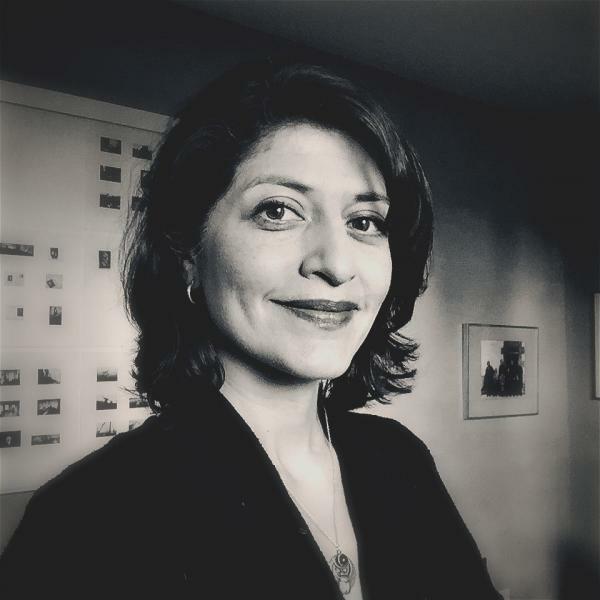 Since 2001, she has reported and produced news and longform stories for Univision, NBC, CNN, NPR, MTV News and Al Jazeera from the Middle East, Africa, Central Asia and Latin America. From 2015 to 2017, she was also Senior Producer at the Fusion/Netflix investigative series, The Naked Truth, which was recognized with the Alfred I. duPont Columbia Journalism Award, an Emmy nomination and the Al Neuharth Award for Innovation in Investigative Journalism. Alvarez is currently a Senior Editor of Investigative Projects at Futuro Media Group. An important theme in Alvarez's work has been the experience of migration, historically and today. She has produced numerous video reports on refugees, undocumented laborers. victims of violence or exploitation and children. In 2001, she crossed the desert border herself on assignment with ABC News Nightline. She was a producer on the Oscar-nominated film, Which Way Home (2009). She produced an episode for the landmark PBS series, Latino Americans (2012), for which she received a Peabody Award and the Imagen Award. Her short film, Fields of Promise (2016), was broadcasted on America ReFramed (PBS World Channel) and awarded the Alfred I. duPont Columbia Journalism Award. She is currently documenting the stories of Salvadoran refugees in the US, some of whom fled the civil war over thirty years ago and are now fighting deportation. The project has received support from the Independent Television Service and Latino Public Broadcasting. The rights of women and girls is also an important theme in Alvarez's work. At ABC, she produced several stories about domestic violence in immigrant, low income and wealthy communities. In 2005, she documented the stories of women in northern Nigeria with injuries related to giving birth for the International Reporting Project Fellowship. In 2006, Alvarez produced, directed and photographed the Showtime documentary, Very Young Girls, which follows the stories of several New York City girls who were sexually exploited and trafficked domestically. Alvarez is a native New Yorker, daughter of Salvadorans and mother of a Salvadoran-Irish-French-American daughter.